Sprite is a computer graphics term for a two-dimensional bitmap that is integrated into a larger scene. 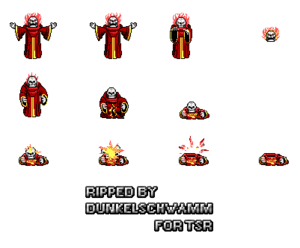 Originally sprites referred to independent objects that are composited together, by hardware, with other elements such as a background. Use of the term sprite has expanded to refer to any two-dimensional bitmap used as part of a graphics display, even if drawn into a frame buffer (by either software or a GPU) instead of being composited on-the-fly at display time. In Catacomb 3D, the game objects such as enemies and items are drawn as raster sprites, whiles the actual geometry of the world itself is drawn as vector polygons subsequently put through a rasterizer and texture mapped for visual consistency. The term sprite was first used in the graphic sense by one of the definers of the Texas Instruments 9918(A) video display processor (VDP). The term was derived from the fact that sprites, rather than being part of the bitmap data in the framebuffer, instead "floated" around on top without affecting the data in the framebuffer below, much like a ghost or "sprite". By this time, sprites had advanced to the point where complete two-dimensional shapes could be moved around the screen horizontally and vertically with minimal software overhead. This page was last edited on 5 January 2019, at 21:52.